The Ryedale Harper comes in a fresh peppermint colour combined with cream tyres and a sprung saddle to complete this bike's stylish look. 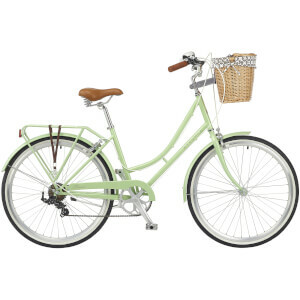 It also features industry leading components on a classic low step-over frame, such as a Ryedale lined full wicker basket up front and also a rear carrier, essential for leisure rides. The sprung saddle increases comfortability and stability throughout the bike, assisted by the micro-alloy adjust seat post. The low maintenance Harper comes with a convenient kickstand, alloy pedals and alloy dual caliper brakes with Tektro alloy levers for increased braking power and control, offering elegant style along with a smooth and reliable ride. Frame 26" Steel Ladies Frame T/T: 28.7, D/T: 28.6x, S/T: 28.6x1.4mmT, H/T: 30x34x ?? ?